← The Water is Coming, the Water is Coming! As we packed the car and prepared to leave our lake cottage at the end of the unpaved road, I was already missing New Hampshire: the white spired churches, our rope swing, “lobstah rolls” and the lazy roads. We were destined for Vermont. site of Dartmouth College and equally impressive Lou’s Restaurant and Bakery, the longest-operated restaurant in Hanover. Opened in 1947, with a menu that featured “hamburger….35 cents,” Lou’s now welcomes guests with a dessert case that makes you realize you have some serious decisions to make if you’re not staying four years. The physical journey from New Hampshire to Vermont is brief; you need only cross the Connecticut River. But the spiritual distance between New Hampshire’s “Live Free or Die” and Vermont’s “Freedom and Unity” mottos suggested we would be traveling a great distance. 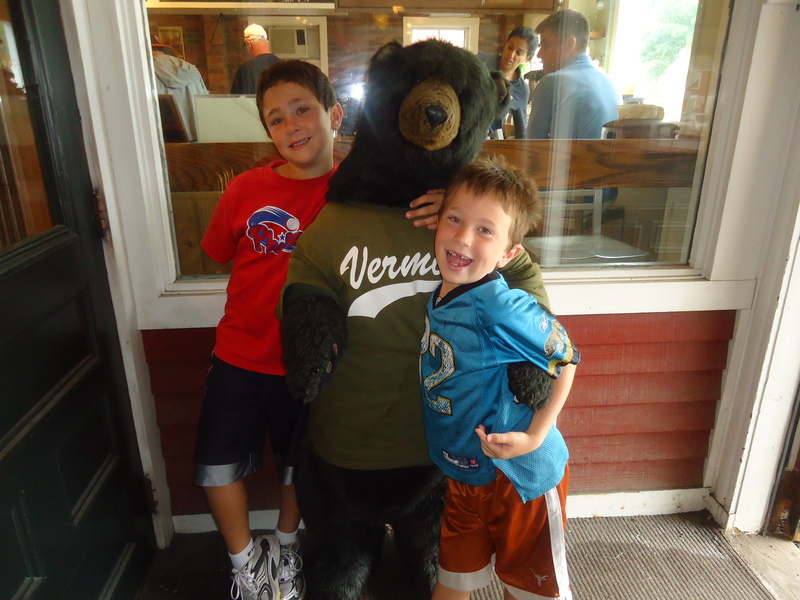 As we made our way north and east on Highway 89, we had three major destinations on our Vermont itinerary: the Green Mountains of Stowe, the Lake Champlain area of Burlington, and the ice cream of Waterbury. 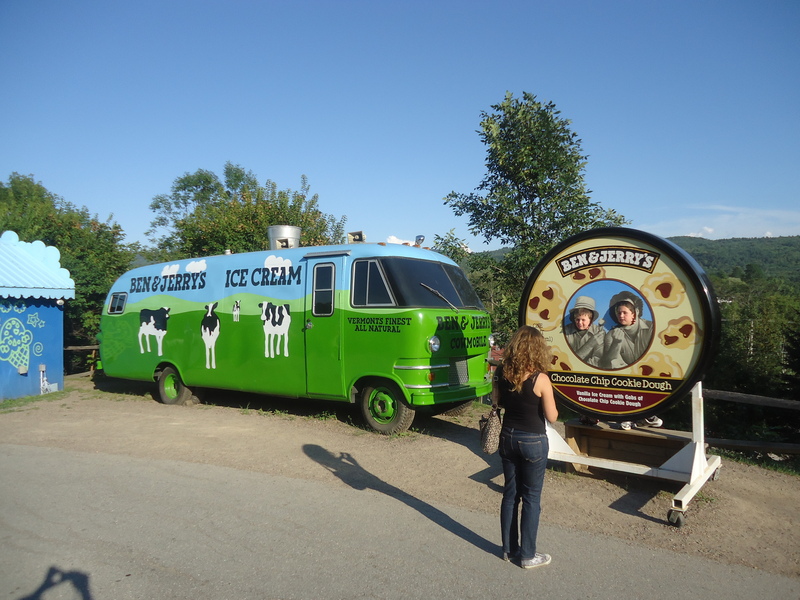 Yes, after weeks of travel, we would finally arrive at Mecca: the Ben & Jerry’s factory tour. 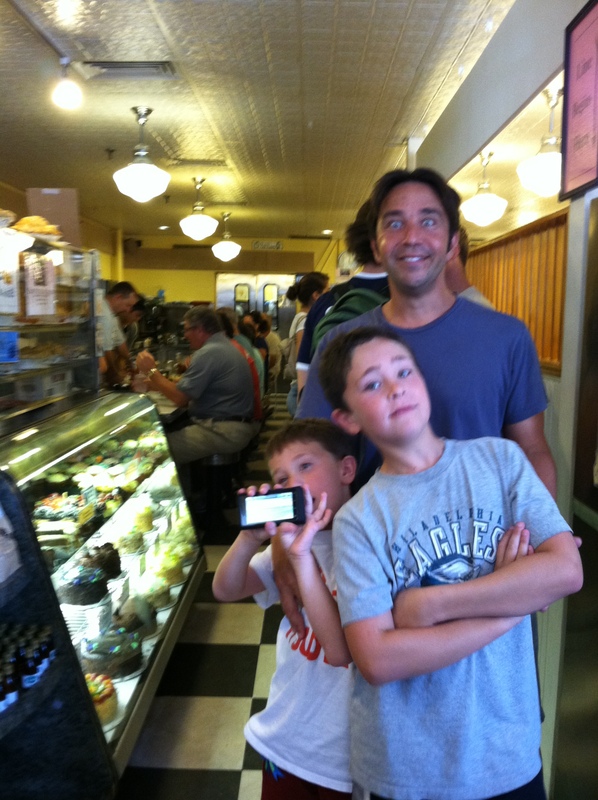 While the kids lobbied to stop first at Ben & Jerry’s, we had the advantage of being in charge of the steering wheel. 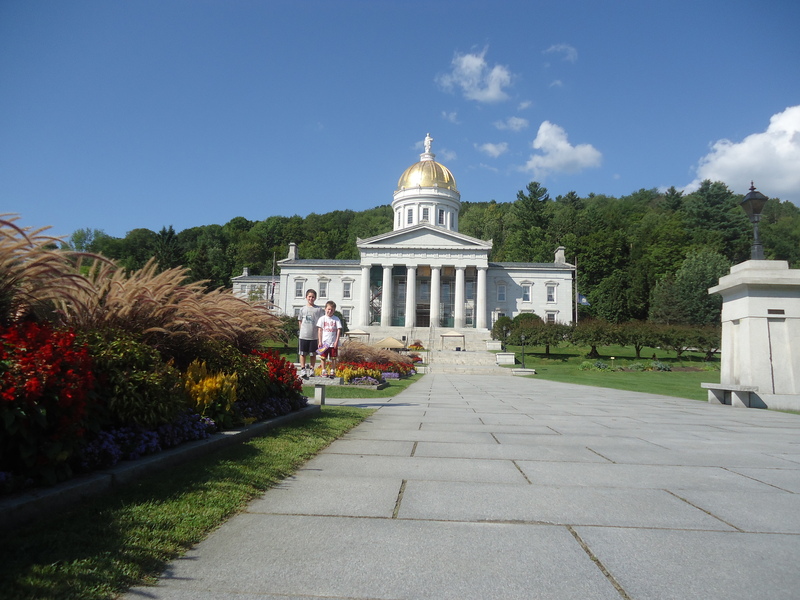 As we approached the highway exit to Vermont’s capitol city, Montpelier, we knew we had to make a detour. The boys rolled their eyes as Christopher intoned, “Guys, did you know this is the least populous capitol in the nation?” (I didn’t doubt it. I had the feeling I could walk into the Governor’s office next door to the Capitol building and ask if he wanted anything from Dunkin’ Donuts.) It also has to be one of the prettiest, its golden dome gleaming against the deep green of the tree-engulfed mountains behind it. 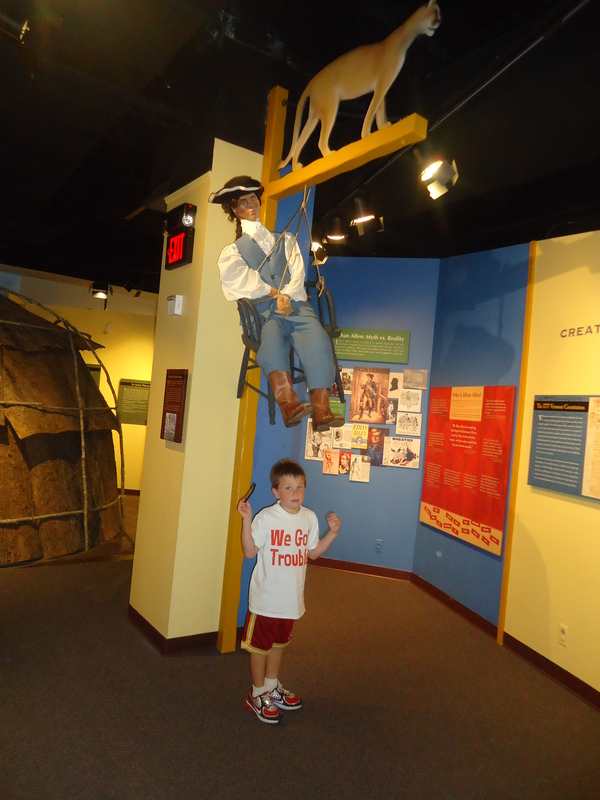 We forced the poor things to enter a museum. Adjacent to the capitol, the Vermont Historical Society has a hands-on, kid-friendly exhibit about the state we had just entered. Kid-friendly is so my speed. We walked through a full-sized Abenaki wigwam, a re-creation of the Catamount Tavern where Ethan Allen’s Green Mountain Boys gathered, a railroad station complete with a working telegraph and a WWII living room furnished with period music and magazines. From abolishing slavery in its first constitution in 1787, through the gay marriage debate, the Vermont Historical Society gave us the skinny on Vermont. Definite thumbs up. 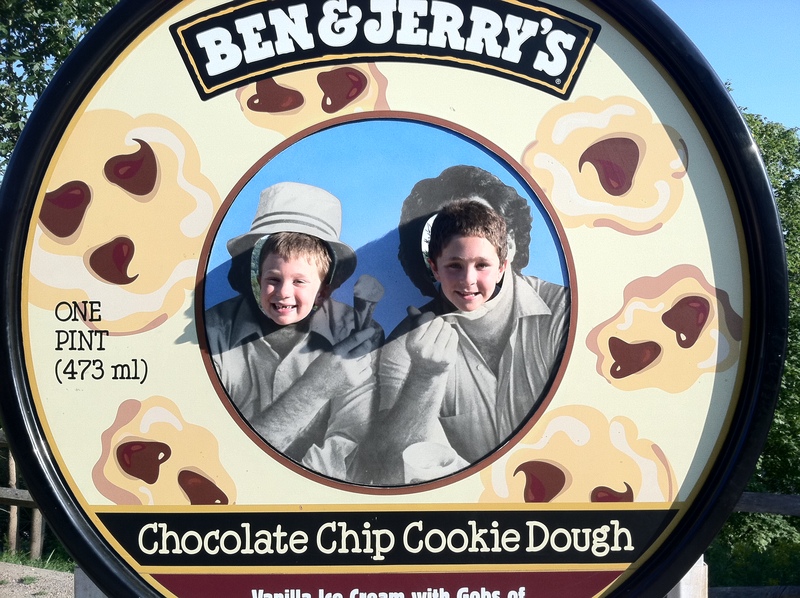 At last we hightailed it to Waterbury and joined the throngs at the Ben & Jerry’s factory. Christopher, ripe with Vermont factoids, piped up: “Did you know this is the most visited tourist attraction in Vermont?” From the moment we entered the parking lot, it was easy to believe. And why shouldn’t it be? 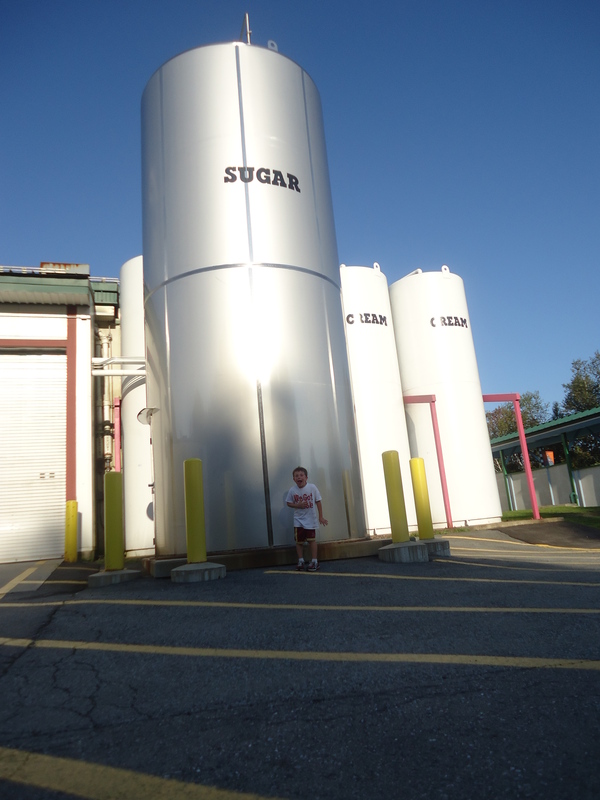 With reasonable tour prices (adults $3, kids free), a heaping taste of a new flavor (“Late Night Snack” for us, featuring chocolate covered potato chips mixed into vanilla! ), and good karmic corporate practices, I was happy to add my name to the list of people who’ve stopped by and taken the requisite photo. As the day faded, we left the land of sweet cream and turned up the mountain road to complete the short distance to Stowe, and our accommodations at the Grey Fox Inn. Ah, Stowe. As soon as we entered the town, I stopped missing New Hampshire. I realized I’d be missing this place all too soon.